Guava Leaf Tea is harvested from our Organic Guava Trees at Quarry Lake Estate and dehydrated naturally. 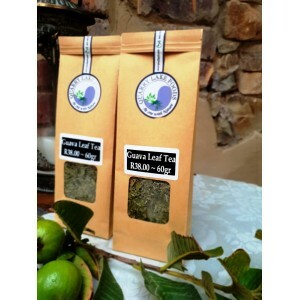 Guava Leaf tea aids in weight loss by preventing the complex starches from being converted into sugars. It acts as an astringent and helps with water retention and reduces cellulite assisting in skin tone. Guava leaves contain natural phytochemicals which effectively kill types of bacteria that can cause infectious diarrhea. Guava Leaf Tea may also benefit your heart and ciculatory system by helping to reduce blood pressure and also helps to reduce blood cholesterol and unhealthy triglycerides. Its anti-diabetic properties help to keep blood sugar low after a high-carbohydrate meal. Other benefits include; treatment for Bronchitis, Treatment for Tothaches, Sore Throats and Gum Disease, Prostate Cancer, Reduction of Allergies, Assists in Sperm Production, Treats Wounds and Infections, Anti-ageing Benefits and Relieves Itching.